The Busby Stoop Inn chair was cursed by Thomas Busby, just before he was hanged for murdering Daniel Auty in 1702. Prior to the murder, Busby ran a coin counterfeiting operation with Daniel, who was also his father-in-law. Both started having problems, which came to a head one evening when Daniel visited the Thirsk, North Yorkshire, inn where Busby lived with his wife, Elizabeth. Some sources say Daniel wanted to take Elizabeth back home, while others say he was just visiting. Whatever the reason, a drunk Busby arrived to find Daniel sitting in his favorite chair. This infuriated Busby and led to a fight. Daniel left after the fight, but Busby followed him home and killed him with a hammer. Busby was sentenced to death for the murder. On his way to his execution, Busby requested a stopover at the inn, where he cursed the chair. Ever since, lots of people who have sat in the chair have died under mysterious circumstances. Some committed suicide, some fell off buildings, some had accidents, some went to war and never returned, and so on. Nevertheless, this did not deter people from sitting in the chair. In the 1970s, Tony Earnshaw, who owned the inn, got so fed up with the deaths attributed to the chair that he took it to the cellar to keep people from sitting in it. Some determined people still went to the cellar to sit in the chair. Earnshaw finally had enough after an ignorant delivery driver died in a car crash a few hours after sitting in the chair. 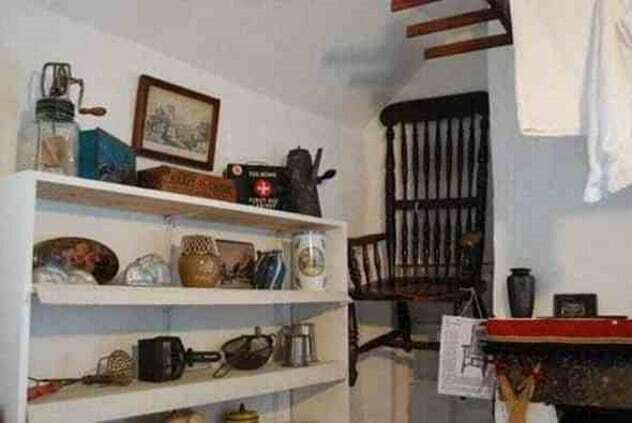 He donated the chair to the Thirsk Museum, where it is suspended from the ceiling to deter people from sitting in it.